before & after / hardwood floors! 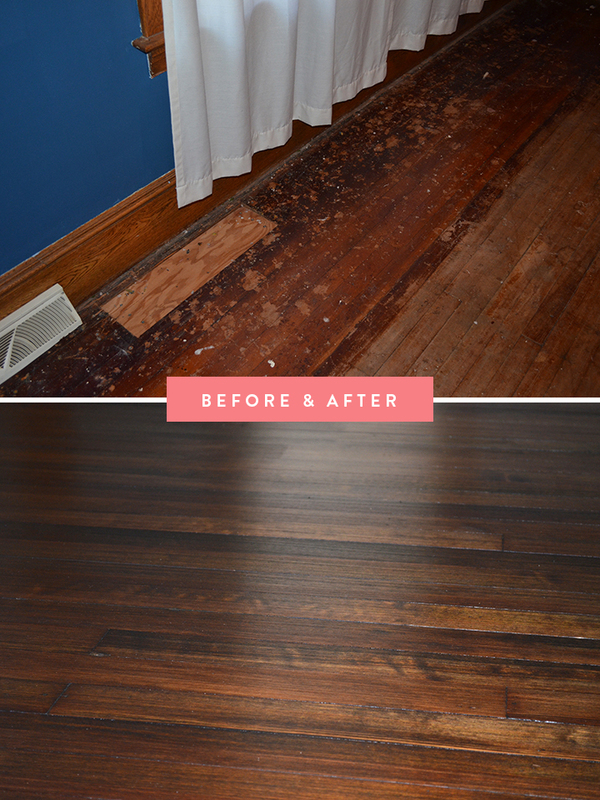 It's been a few months since we had our hardwood floors refinished, and since November I've been meaning to edit the photos and write the post. Life just gets in the way! I feel like I've been phoning it in a bit since January and I'm really hoping to post more home projects, design projects, and recipes soon! Original content FTW. Anyhow! I can't even begin to tell you the rollercoaster of emotions that goes into having your hardwood floors refinished. Fear / joy / terror / bliss... you get the picture! Saddle up for a LONG post with a lot of pictures; this was one doozy of a process and I tried to document the whole thing. Our realtor told us that he wasn't sure there was hardwood underneath the carpeting, and that he was pretty certain the previous homeowners had recently carpeted the floors to cover up tile. TILE! I was so sad. Yet, I was 25 and eager and the rest of the house was full of such potential that I just let that part of my house-hunting heart die. I've never lived in a home without hardwood floors and I have a love-hate thing with carpeting, so I was disappointed but we bought the house anyway. It had a back deck and a giant kitchen, so the pros clearly outweighed the cons! The decor was good, but there was just something missing. Between the light beige walls, our airy, light decor and the nubby cream carpeting, our first floor felt like an old folk's home (I have NO idea how to describe that accurately, but it's how it felt to me - think, the puffy sweatsuit that your grandmother wore that's all one color and pastel). We needed something to anchor the space and that something was rich, beautiful hardwood floors. The floor was in terrible condition. It was three different colors - dark stain, medium stain, and the naked wood. For the life of me I couldn't figure out why until a friend of mine told me back in the day, they would only stain around area rugs to save money. Talk about crazy frugal efficiency! On top of the ombré stain situation, we were also dealing with dozens of areas that were patched with plywood. In one area, we could even see the plumbing pipes through the crack in the plywood! It looked like a real hack job. There were hundreds of staples, nails, and huge chunks of glue and foam everywhere, but it only took us a few days to remove it all. We were persistent! We lived with it for a while as we saved money to refinish them (hence the "no planning"; really, save ahead of time if you plan to do this!). We contemplated doing the refinishing ourselves and I did hours of research watching videos, reading tutorials, and asking friends who had done this before. Ultimately, we didn't know how much the floor had already been sanded and with antique floors like ours, you can reach a point of no return if you sand them too much before they need replacing. It was too much of a gamble so we decided to go with the pros: Craftsman Custom Flooring, Inc. A friend of ours referred them and we were not disappointed. Picking out the stains was a gleeful experience... we were so close! I eyed them up and each of us made our decision - all of the contractors and Tim chose the same one; Ebony, and I was stuck between Ebony (3rd in from the left) and whatever the 1st one was called. The 2nd and 4th repelled me due to the red tones. I loved the rich tones of the 1st one, but ultimately I gave in and chose Ebony as well. I'm so glad I did because the Ebony came out beautifully, rich and dark - the 1st stain would have been WAY too dark. We had our floors refinished in early November. It wasn't exactly an ideal time to leave the windows open to let air circulate through the house, but we followed the rules and cranked the thermostat when needed, and cracked the windows when we were told. Not fun for the heating bill, but hey, it's all part of the process! We stayed at my sister's house the first night, and foolishly thought we could stay home the next night. About 20-30 minutes after coming home, I felt dizzy and had a pounding headache. We packed our bags and booked a room at the Hyatt Place (I LOVE that hotel) because we felt ritzy and were already spending so much; what was an extra $150 for a night of pampered leisure? Well, the following night we thought we were in the clear to stay home. Again, wrong! We packed more bags and headed to the Red Roof Inn. We could have stayed with family but as a business owner, Tim has crazy hours and we didn't want to disrupt anyone's schedule. Three longgggg nights later, we were cleared to come home! Man, it was a process. I kind of wish it was summertime so we could've camped in our backyard, but all in all, we had shiny new floors and that was all that mattered! Have you refinished your hardwood floors, or had them professionally done? Or, are you like I was last year: petrified to rip up the carpeting but desperate to have hardwood floors? I swear, they need to invent something like X-ray vision to see through carpeting. Maybe that will be my first invention!